Recently Ethan Holt and I were casted as the highlining/yoga talent for an Icebreaker’s (merino wool clothing) commercial at Smith Rock State Park. 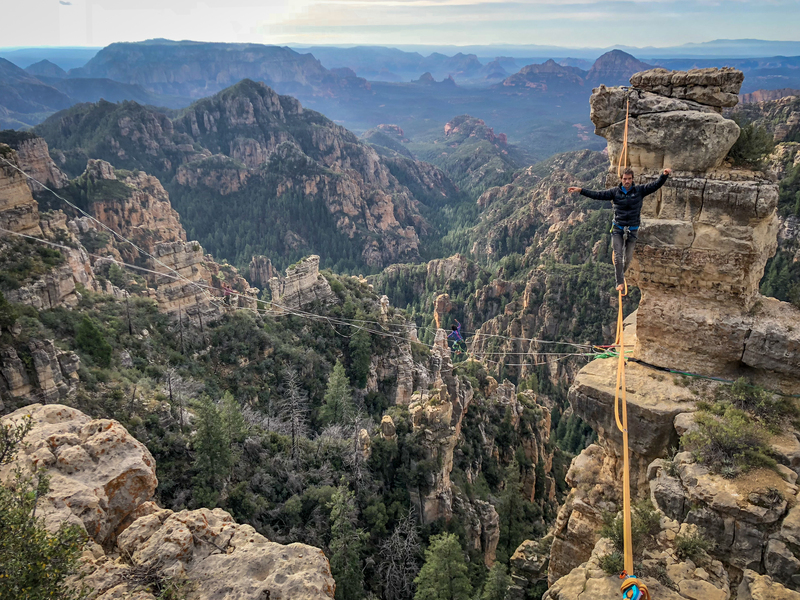 The line we were assigned to perform on was the original Monkey Face Highline, which at this point is an easy stroll in the park for both of us but is nonetheless a very special line in its own right. The history surrounding this highline is in many ways the birthplace of Ethan and I’s strong friendship as slackliners and is also the location of the first highline established at the park in the late 1980’s. I recall many years ago now, standing by the edge of the line offering encouraging words to Ethan as he was scared and intimidated by this line, trying to find the courage to take another step toward success. So much has happened since that day as many lines have been rigged and walked on both our parts. Ethan never ceases to amaze me as he is continually progressing in his balance and walking lines of greater lengths with absolute easy and calm meditation. This recorded event was our first experience filming for a commercial and was also very nostalgic since it was the first highline we both walked in our ever growing list of conquered highlines. The Monkey Line is by no means the hardest higline to walk at Smith Rock, as there are now 18 other lines here to measure yourself against, but it continues to be a classic that every slacker must experience at some point on his/her balanced path of life. I hope the message conveyed is both thoughtful and true to the slacklife and human spirit. Feel free to follow the Icebreaker campaign of Explore Awesome on Facebook. CLICK HERE to view and “like” them if you’re supportive of the cause.